This article is about the vectors mainly used in physics and engineering to represent directed quantities. For mathematical vectors in general, see Vector (mathematics and physics). For other uses, see Vector (disambiguation). A vector is what is needed to "carry" the point A to the point B; the Latin word vector means "carrier". It was first used by 18th century astronomers investigating planetary revolution around the Sun. The magnitude of the vector is the distance between the two points and the direction refers to the direction of displacement from A to B. Many algebraic operations on real numbers such as addition, subtraction, multiplication, and negation have close analogues for vectors, operations which obey the familiar algebraic laws of commutativity, associativity, and distributivity. These operations and associated laws qualify Euclidean vectors as an example of the more generalized concept of vectors defined simply as elements of a vector space. Vectors play an important role in physics: the velocity and acceleration of a moving object and the forces acting on it can all be described with vectors. Many other physical quantities can be usefully thought of as vectors. Although most of them do not represent distances (except, for example, position or displacement), their magnitude and direction can still be represented by the length and direction of an arrow. The mathematical representation of a physical vector depends on the coordinate system used to describe it. Other vector-like objects that describe physical quantities and transform in a similar way under changes of the coordinate system include pseudovectors and tensors. The concept of vector, as we know it today, evolved gradually over a period of more than 200 years. About a dozen people made significant contributions. The algebraically imaginary part, being geometrically constructed by a straight line, or radius vector, which has, in general, for each determined quaternion, a determined length and determined direction in space, may be called the vector part, or simply the vector of the quaternion. Several other mathematicians developed vector-like systems in the middle of the nineteenth century, including Augustin Cauchy, Hermann Grassmann, August Möbius, Comte de Saint-Venant, and Matthew O'Brien. Grassmann's 1840 work Theorie der Ebbe und Flut (Theory of the Ebb and Flow) was the first system of spatial analysis similar to today's system and had ideas corresponding to the cross product, scalar product and vector differentiation. Grassmann's work was largely neglected until the 1870s. Peter Guthrie Tait carried the quaternion standard after Hamilton. His 1867 Elementary Treatise of Quaternions included extensive treatment of the nabla or del operator ∇. In 1878 Elements of Dynamic was published by William Kingdon Clifford. Clifford simplified the quaternion study by isolating the dot product and cross product of two vectors from the complete quaternion product. This approach made vector calculations available to engineers and others working in three dimensions and skeptical of the fourth. Josiah Willard Gibbs, who was exposed to quaternions through James Clerk Maxwell's Treatise on Electricity and Magnetism, separated off their vector part for independent treatment. The first half of Gibbs's Elements of Vector Analysis, published in 1881, presents what is essentially the modern system of vector analysis. In 1901 Edwin Bidwell Wilson published Vector Analysis, adapted from Gibb's lectures, which banished any mention of quaternions in the development of vector calculus. In physics and engineering, a vector is typically regarded as a geometric entity characterized by a magnitude and a direction. It is formally defined as a directed line segment, or arrow, in a Euclidean space. In pure mathematics, a vector is defined more generally as any element of a vector space. In this context, vectors are abstract entities which may or may not be characterized by a magnitude and a direction. This generalized definition implies that the above-mentioned geometric entities are a special kind of vectors, as they are elements of a special kind of vector space called Euclidean space. This article is about vectors strictly defined as arrows in Euclidean space. When it becomes necessary to distinguish these special vectors from vectors as defined in pure mathematics, they are sometimes referred to as geometric, spatial, or Euclidean vectors. in space represent the same free vector if they have the same magnitude and direction: that is, they are equivalent if the quadrilateral ABB′A′ is a parallelogram. If the Euclidean space is equipped with a choice of origin, then a free vector is equivalent to the bound vector of the same magnitude and direction whose initial point is the origin. The term vector also has generalizations to higher dimensions and to more formal approaches with much wider applications. Since the physicist's concept of force has a direction and a magnitude, it may be seen as a vector. As an example, consider a rightward force F of 15 newtons. If the positive axis is also directed rightward, then F is represented by the vector 15 N, and if positive points leftward, then the vector for F is −15 N. In either case, the magnitude of the vector is 15 N. Likewise, the vector representation of a displacement Δs of 4 meters would be 4 m or −4 m, depending on its direction, and its magnitude would be 4 m regardless. Vectors are fundamental in the physical sciences. They can be used to represent any quantity that has magnitude, has direction, and which adheres to the rules of vector addition. An example is velocity, the magnitude of which is speed. For example, the velocity 5 meters per second upward could be represented by the vector (0, 5) (in 2 dimensions with the positive y-axis as 'up'). Another quantity represented by a vector is force, since it has a magnitude and direction and follows the rules of vector addition. Vectors also describe many other physical quantities, such as linear displacement, displacement, linear acceleration, angular acceleration, linear momentum, and angular momentum. Other physical vectors, such as the electric and magnetic field, are represented as a system of vectors at each point of a physical space; that is, a vector field. Examples of quantities that have magnitude and direction but fail to follow the rules of vector addition are angular displacement and electric current. Consequently, these are not vectors. pointing from the point x = 1 on the x-axis to the point y = 1 on the y-axis. In Cartesian coordinates a free vector may be thought of in terms of a corresponding bound vector, in this sense, whose initial point has the coordinates of the origin O = (0, 0, 0). It is then determined by the coordinates of that bound vector's terminal point. Thus the free vector represented by (1, 0, 0) is a vector of unit length pointing along the direction of the positive x-axis. (1, 2, 3) + (−2, 0, 4) = (1 − 2, 2 + 0, 3 + 4) = (−1, 2, 7). In the geometrical and physical settings, sometimes it is possible to associate, in a natural way, a length or magnitude and a direction to vectors. In addition, the notion of direction is strictly associated with the notion of an angle between two vectors. If the dot product of two vectors is defined—a scalar-valued product of two vectors—then it is also possible to define a length; the dot product gives a convenient algebraic characterization of both angle (a function of the dot product between any two non-zero vectors) and length (the square root of the dot product of a vector by itself). In three dimensions, it is further possible to define the cross product, which supplies an algebraic characterization of the area and orientation in space of the parallelogram defined by two vectors (used as sides of the parallelogram). In any dimension (and, in particular, higher dimensions), it's possible to define the exterior product, which (among other things) supplies an algebraic characterization of the area and orientation in space of the n-dimensional parallelotope defined by n vectors. However, it is not always possible or desirable to define the length of a vector in a natural way. This more general type of spatial vector is the subject of vector spaces (for free vectors) and affine spaces (for bound vectors, as each represented by an ordered pair of "points"). An important example is Minkowski space that is important to our understanding of special relativity, where there is a generalization of length that permits non-zero vectors to have zero length. Other physical examples come from thermodynamics, where many of the quantities of interest can be considered vectors in a space with no notion of length or angle. In physics, as well as mathematics, a vector is often identified with a tuple of components, or list of numbers, that act as scalar coefficients for a set of basis vectors. When the basis is transformed, for example by rotation or stretching, then the components of any vector in terms of that basis also transform in an opposite sense. The vector itself has not changed, but the basis has, so the components of the vector must change to compensate. The vector is called covariant or contravariant depending on how the transformation of the vector's components is related to the transformation of the basis. In general, contravariant vectors are "regular vectors" with units of distance (such as a displacement) or distance times some other unit (such as velocity or acceleration); covariant vectors, on the other hand, have units of one-over-distance such as gradient. If you change units (a special case of a change of basis) from meters to millimeters, a scale factor of 1/1000, a displacement of 1 m becomes 1000 mm—a contravariant change in numerical value. In contrast, a gradient of 1 K/m becomes 0.001 K/mm—a covariant change in value. See covariance and contravariance of vectors. Tensors are another type of quantity that behave in this way; a vector is one type of tensor. In pure mathematics, a vector is any element of a vector space over some field and is often represented as a coordinate vector. The vectors described in this article are a very special case of this general definition because they are contravariant with respect to the ambient space. Contravariance captures the physical intuition behind the idea that a vector has "magnitude and direction". Vectors are usually shown in graphs or other diagrams as arrows (directed line segments), as illustrated in the figure. Here the point A is called the origin, tail, base, or initial point; point B is called the head, tip, endpoint, terminal point or final point. The length of the arrow is proportional to the vector's magnitude, while the direction in which the arrow points indicates the vector's direction. On a two-dimensional diagram, sometimes a vector perpendicular to the plane of the diagram is desired. These vectors are commonly shown as small circles. A circle with a dot at its centre (Unicode U+2299 ⊙) indicates a vector pointing out of the front of the diagram, toward the viewer. A circle with a cross inscribed in it (Unicode U+2297 ⊗) indicates a vector pointing into and behind the diagram. These can be thought of as viewing the tip of an arrow head on and viewing the flights of an arrow from the back. A vector in the Cartesian plane, showing the position of a point A with coordinates (2, 3). In order to calculate with vectors, the graphical representation may be too cumbersome. Vectors in an n-dimensional Euclidean space can be represented as coordinate vectors in a Cartesian coordinate system. The endpoint of a vector can be identified with an ordered list of n real numbers (n-tuple). These numbers are the coordinates of the endpoint of the vector, with respect to a given Cartesian coordinate system, and are typically called the scalar components (or scalar projections) of the vector on the axes of the coordinate system. is usually not deemed necessary and very rarely used. This can be generalised to n-dimensional Euclidean space (or Rn). where a1, a2, a3 are called the vector components (or vector projections) of a on the basis vectors or, equivalently, on the corresponding Cartesian axes x, y, and z (see figure), while a1, a2, a3 are the respective scalar components (or scalar projections). The notation ei is compatible with the index notation and the summation convention commonly used in higher level mathematics, physics, and engineering. As explained above a vector is often described by a set of vector components that add up to form the given vector. Typically, these components are the projections of the vector on a set of mutually perpendicular reference axes (basis vectors). The vector is said to be decomposed or resolved with respect to that set. Illustration of tangential and normal components of a vector to a surface. The decomposition or resolution of a vector into components is not unique, because it depends on the choice of the axes on which the vector is projected. ). The latter two choices are more convenient for solving problems which possess cylindrical or spherical symmetry respectively. The choice of a basis does not affect the properties of a vector or its behaviour under transformations. A vector can also be broken up with respect to "non-fixed" basis vectors that change their orientation as a function of time or space. For example, a vector in three-dimensional space can be decomposed with respect to two axes, respectively normal, and tangent to a surface (see figure). Moreover, the radial and tangential components of a vector relate to the radius of rotation of an object. The former is parallel to the radius and the latter is orthogonal to it. In these cases, each of the components may be in turn decomposed with respect to a fixed coordinate system or basis set (e.g., a global coordinate system, or inertial reference frame). Two vectors are parallel if they have the same direction but not necessarily the same magnitude, or antiparallel if they have opposite direction but not necessarily the same magnitude. This addition method is sometimes called the parallelogram rule because a and b form the sides of a parallelogram and a + b is one of the diagonals. If a and b are bound vectors that have the same base point, this point will also be the base point of a + b. One can check geometrically that a + b = b + a and (a + b) + c = a + (b + c). Scalar multiplication of a vector by a factor of 3 stretches the vector out. Intuitively, multiplying by a scalar r stretches a vector out by a factor of r. Geometrically, this can be visualized (at least in the case when r is an integer) as placing r copies of the vector in a line where the endpoint of one vector is the initial point of the next vector. Scalar multiplication is distributive over vector addition in the following sense: r(a + b) = ra + rb for all vectors a and b and all scalars r. One can also show that a − b = a + (−1)b. The length or magnitude or norm of the vector a is denoted by ‖a‖ or, less commonly, |a|, which is not to be confused with the absolute value (a scalar "norm"). which is a consequence of the Pythagorean theorem since the basis vectors e1, e2, e3 are orthogonal unit vectors. A unit vector is any vector with a length of one; normally unit vectors are used simply to indicate direction. A vector of arbitrary length can be divided by its length to create a unit vector. This is known as normalizing a vector. A unit vector is often indicated with a hat as in â.
, 0, or simply 0. Unlike any other vector, it has an arbitrary or indeterminate direction, and cannot be normalized (that is, there is no unit vector that is a multiple of the zero vector). The sum of the zero vector with any vector a is a (that is, 0 + a = a). where θ is the measure of the angle between a and b (see trigonometric function for an explanation of cosine). Geometrically, this means that a and b are drawn with a common start point and then the length of a is multiplied with the length of the component of b that points in the same direction as a.
where θ is the measure of the angle between a and b, and n is a unit vector perpendicular to both a and b which completes a right-handed system. The right-handedness constraint is necessary because there exist two unit vectors that are perpendicular to both a and b, namely, n and (–n). The cross product a × b is defined so that a, b, and a × b also becomes a right-handed system (but note that a and b are not necessarily orthogonal). This is the right-hand rule. The length of a × b can be interpreted as the area of the parallelogram having a and b as sides. 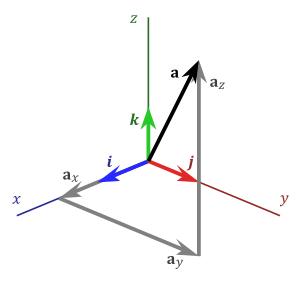 For arbitrary choices of spatial orientation (that is, allowing for left-handed as well as right-handed coordinate systems) the cross product of two vectors is a pseudovector instead of a vector (see below). It has three primary uses. First, the absolute value of the box product is the volume of the parallelepiped which has edges that are defined by the three vectors. Second, the scalar triple product is zero if and only if the three vectors are linearly dependent, which can be easily proved by considering that in order for the three vectors to not make a volume, they must all lie in the same plane. Third, the box product is positive if and only if the three vectors a, b and c are right-handed. By referring collectively to e1, e2, e3 as the e basis and to n1, n2, n3 as the n basis, the matrix containing all the cjk is known as the "transformation matrix from e to n", or the "rotation matrix from e to n" (because it can be imagined as the "rotation" of a vector from one basis to another), or the "direction cosine matrix from e to n" (because it contains direction cosines). The properties of a rotation matrix are such that its inverse is equal to its transpose. This means that the "rotation matrix from e to n" is the transpose of "rotation matrix from n to e". the rows and columns are orthogonal unit vectors, therefore their dot products are zero. The advantage of this method is that a direction cosine matrix can usually be obtained independently by using Euler angles or a quaternion to relate the two vector bases, so the basis conversions can be performed directly, without having to work out all the dot products described above. By applying several matrix multiplications in succession, any vector can be expressed in any basis so long as the set of direction cosines is known relating the successive bases. A seven-dimensional cross product is similar to the cross product in that its result is a vector orthogonal to the two arguments; there is however no natural way of selecting one of the possible such products. Vectors have many uses in physics and other sciences. In abstract vector spaces, the length of the arrow depends on a dimensionless scale. If it represents, for example, a force, the "scale" is of physical dimension length/force. Thus there is typically consistency in scale among quantities of the same dimension, but otherwise scale ratios may vary; for example, if "1 newton" and "5 m" are both represented with an arrow of 2 cm, the scales are 1 m:50 N and 1:250 respectively. Equal length of vectors of different dimension has no particular significance unless there is some proportionality constant inherent in the system that the diagram represents. Also length of a unit vector (of dimension length, not length/force, etc.) has no coordinate-system-invariant significance. Often in areas of physics and mathematics, a vector evolves in time, meaning that it depends on a time parameter t. For instance, if r represents the position vector of a particle, then r(t) gives a parametric representation of the trajectory of the particle. Vector-valued functions can be differentiated and integrated by differentiating or integrating the components of the vector, and many of the familiar rules from calculus continue to hold for the derivative and integral of vector-valued functions. The position vector has dimensions of length. which specifies the position of y relative to x. The length of this vector gives the straight-line distance from x to y. Displacement has the dimensions of length. where x0 is the position at time t = 0. Velocity is the time derivative of position. Its dimensions are length/time. Acceleration a of a point is vector which is the time derivative of velocity. Its dimensions are length/time2. v. This important requirement is what distinguishes a contravariant vector from any other triple of physically meaningful quantities. For example, if v consists of the x, y, and z-components of velocity, then v is a contravariant vector: if the coordinates of space are stretched, rotated, or twisted, then the components of the velocity transform in the same way. On the other hand, for instance, a triple consisting of the length, width, and height of a rectangular box could make up the three components of an abstract vector, but this vector would not be contravariant, since rotating the box does not change the box's length, width, and height. Examples of contravariant vectors include displacement, velocity, electric field, momentum, force, and acceleration. In the language of differential geometry, the requirement that the components of a vector transform according to the same matrix of the coordinate transition is equivalent to defining a contravariant vector to be a tensor of contravariant rank one. Alternatively, a contravariant vector is defined to be a tangent vector, and the rules for transforming a contravariant vector follow from the chain rule. Some vectors transform like contravariant vectors, except that when they are reflected through a mirror, they flip and gain a minus sign. A transformation that switches right-handedness to left-handedness and vice versa like a mirror does is said to change the orientation of space. A vector which gains a minus sign when the orientation of space changes is called a pseudovector or an axial vector. Ordinary vectors are sometimes called true vectors or polar vectors to distinguish them from pseudovectors. Pseudovectors occur most frequently as the cross product of two ordinary vectors. One example of a pseudovector is angular velocity. Driving in a car, and looking forward, each of the wheels has an angular velocity vector pointing to the left. If the world is reflected in a mirror which switches the left and right side of the car, the reflection of this angular velocity vector points to the right, but the actual angular velocity vector of the wheel still points to the left, corresponding to the minus sign. 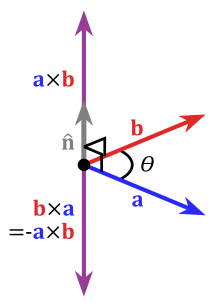 Other examples of pseudovectors include magnetic field, torque, or more generally any cross product of two (true) vectors. This distinction between vectors and pseudovectors is often ignored, but it becomes important in studying symmetry properties. See parity (physics). ^ Latin: vectus, perfect participle of vehere, "to carry"/ veho = "I carry". For historical development of the word vector, see "vector n.". Oxford English Dictionary (3rd ed.). Oxford University Press. September 2005. (Subscription or UK public library membership required.) and Jeff Miller. "Earliest Known Uses of Some of the Words of Mathematics". Retrieved 2007-05-25. ^ The Oxford english dictionary (2nd. ed.). London: Claredon Press. 2001. ISBN 9780195219425. ^ a b c d Michael J. Crowe, A History of Vector Analysis; see also his "lecture notes" (PDF). Archived from the original (PDF) on January 26, 2004. Retrieved 2010-09-04. on the subject. ^ Formerly known as located vector. See Lang 1986, p. 9. ^ Gibbs, J.W. (1901). Vector Analysis: A Text-book for the Use of Students of Mathematics and Physics, Founded upon the Lectures of J. Willard Gibbs, by E.B. Wilson, Chares Scribner's Sons, New York, p. 15: "Any vector r coplanar with two non-collinear vectors a and b may be resolved into two components parallel to a and b respectively. This resolution may be accomplished by constructing the parallelogram ..."
^ U. Guelph Physics Dept., "Torque and Angular Acceleration"
^ M., Rogers, Robert (2007). Applied mathematics in integrated navigation systems (3rd ed.). Reston, Va.: American Institute of Aeronautics and Astronautics. ISBN 9781563479274. OCLC 652389481. Apostol, Tom (1967). Calculus. Vol. 1: One-Variable Calculus with an Introduction to Linear Algebra. Wiley. ISBN 978-0-471-00005-1. Apostol, Tom (1969). Calculus. Vol. 2: Multi-Variable Calculus and Linear Algebra with Applications. Wiley. ISBN 978-0-471-00007-5. Heinbockel, J. H. (2001), Introduction to Tensor Calculus and Continuum Mechanics, Trafford Publishing, ISBN 1-55369-133-4 . Ito, Kiyosi (1993), Encyclopedic Dictionary of Mathematics (2nd ed. ), MIT Press, ISBN 978-0-262-59020-4 . Ivanov, A.B. (2001) , "Vector, geometric", in Hazewinkel, Michiel (ed. ), Encyclopedia of Mathematics, Springer Science+Business Media B.V. / Kluwer Academic Publishers, ISBN 978-1-55608-010-4 . Kane, Thomas R.; Levinson, David A. (1996), Dynamics Online, Sunnyvale, California: OnLine Dynamics . Lang, Serge (1986). Introduction to Linear Algebra (2nd ed.). Springer. ISBN 0-387-96205-0. Pedoe, Daniel (1988). Geometry: A comprehensive course. Dover. ISBN 0-486-65812-0. Aris, R. (1990). Vectors, Tensors and the Basic Equations of Fluid Mechanics. Dover. ISBN 978-0-486-66110-0. Feynman, Richard; Leighton, R.; Sands, M. (2005). "Chapter 11". The Feynman Lectures on Physics. Vol. I (2nd ed.). Addison Wesley. ISBN 978-0-8053-9046-9. Wikimedia Commons has media related to Vectors.